Working in Florence, the Cione brothers, Jacopo, Andrea (Orcagna), Nardo and Matteo often collaborated. The brothers regarded themselves as architects, sculptors and painters. Jacopo was the youngest of the three and completed some of his brothers’ unfinished works. Andrea, called Orcagna is often said to be the most famous of his brothers, whose work was sometimes misattributed to his older brother Nardo. Orcagna completed his most notable sculpture work for the Brotherhood of Orsanmichele in 1359. The marble tabernacle is attributed by some to be a perfect example of Italian Gothic art. The allegorical pieces depict figures of virtue in a richly decorated marble tabernacle that surrounds a repainting of Bernardo Daddi’s Madonna and Child. The piece was commissioned by the Brotherhood, who used the offerings made to the Virgin during the 1348 plague. Jacopo’s sculptural work is best known in what he completed from his brother Matteo’s marble pieces in the Florence Cathedral. Finishing what Matteo left incomplete after death, Jacopo went on to create several pieces for the Cathedral, including decorations for its marble statues. St. Matthew and stories from his life is a major piece for both Orcagna and Jacopo, who collaborated on the painting for the church of Orsanmichele (Kitchen Garden of St. Michael). Orcagna began the work in 1367 and Jacopo completed it; the piece has been in the Uffizi Gallery since 1899. Orcagna’s other painted works include Virgin with Angels (or The Redeemer with Madonna and Saints) for the Basilica di Santa Maria Novella between 1354 -1357. His brother Nardo also did a fresco of the Divine Judgment for the Santa Maria Novella. Orcagna also completed, Vision of St. Bernard in the Academy of Florence and Coronation of the Virgin, for the church of San Pier Maggiore in Florence. 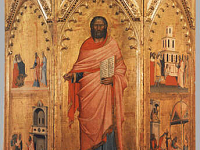 It was in the church San Pier Maggiore that Jacopo collaborated with Niccoló di Pietro Gerini on an altarpiece in 1370. It was an unusually large commission for the 14th century in Florence, of which Niccoló reaped most having designed it. 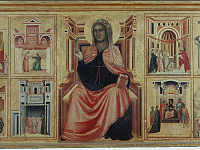 Jacopo painted the narrative pieces accompanying the twelve paneled piece, of which some can be seen today in the National Gallery of London. The artists worked together again on a piece for the mint of Florence in 1373, Coronation of the Virgin, and also for a fresco of the Annunciation, in the Palazzo dei Priori in 1386. Jacopo often collaborated with his brothers, among others, but also completed individual works for the Loggia dei Priori in Florence, in the Avignon office of Francesco di Marco Datini, and the altarpiece for the Church of San Lorenzo in Florence.